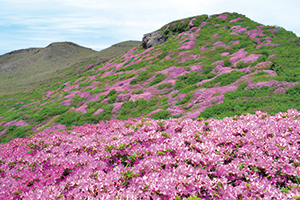 Aso-Kuju National Park was born in 1934. The main characteristics of the park are Mt. 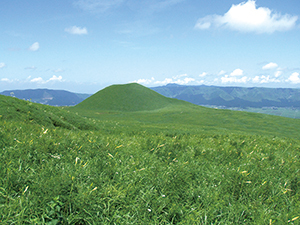 Aso standing on a huge caldera, a volcanic group spreading to the north including Kuju Mountain Range, and magnificent and gentle grasslands surrounding them. Around Mt. Aso, located in the south of the park, you can see magnificent and marvelous scenery including a fuming Mt. Nakadake crater, beautiful volcanic cone of Komezuka, vast Kusasenri-ga-hama, and the crater floor and somma surrounding them. Around Kuju Mountain Range in the middle of the park, there can be seen solfataric phenomena and scenery unique to volcanoes. 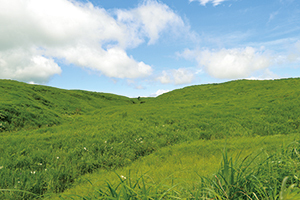 There are many highlights, such as the vast grasslands of Kuju Plateau and and Handa Highland and scholarly important wetlands of Tadewara Moor and Bogatsuru Moor. In the north of the park, Mt. Tsurumi and Mt. 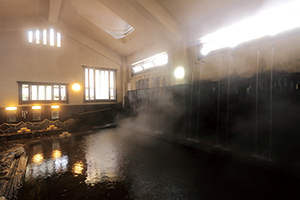 Yufudake, which are the source of onsens, such as Beppu and Yufuin, boast beautiful mountain shapes. The ridges command a panoramic view from Beppu Bay and Yufuin Basin to Kuju Mountain Range. Mt. 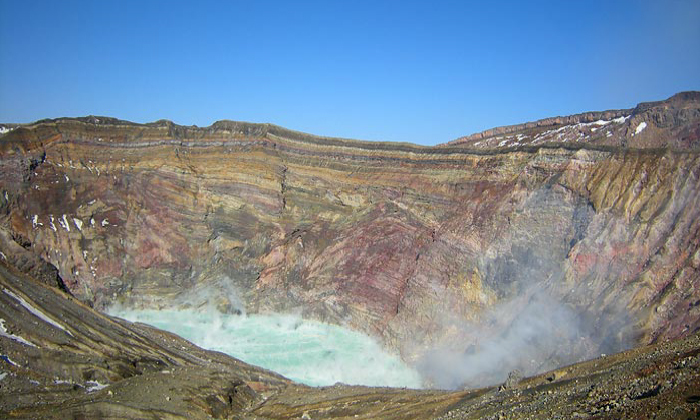 Aso has one of the world's largest calderas at about 25 km north-south and 18 km east-west consisting of the central cone composed of the five peaks of Mt. Aso (the highest one is Mt. 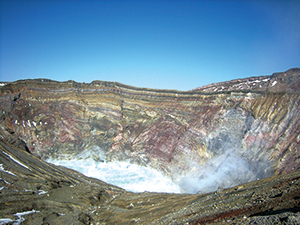 Takadake, 1,592 m above sea level) and the crater floor and somma surrounding them. Although the scenery is rough around the volcano, the more you go away from the crater rim, the more you will see grasslands with many plants on a more pastoral landscape. On the other hand, Kuju Mountain Range, as a tholoid volcanic topography consisting of peaks, including Mt. 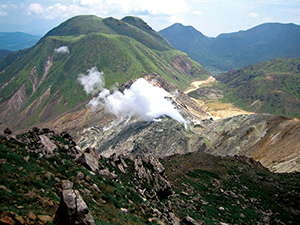 Nakadake (the highest peak, 1,791 m high), offers more diverse scenery. There are volcanic plateaus formed by volcanic ash and other materials in its north and south, presenting magnificent grassland scenery. There also are many dips that have developed into a lot of moors by abundant spring water and rainfall. Such a contrast of volcano and grasslands is one of the major attractions for visitors to this park. The ecology of this park is roughly classified into three of solfataric wilderness where volcanic gas fumes; forests that spread over the mountain base; and grassland that is maintained by controlled burning and mowing. The solfataric wilderness has peculiar biota where animals and plants have adopted to the harsh environment. The forests, including secondary forest and natural forest among other types, foster a wide variety of animals and plants. 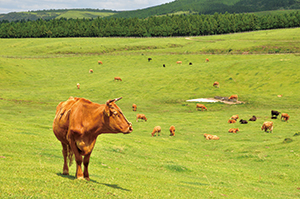 The grassland shows different vegetation depending on usage and management by human, including tall-grass vegetation where Japanese silver grass is dominant by continued controlled burning and mowing, and short-grass vegetation where zoysia is dominant by pasturing of cows and horses, each presenting ecology that fosters specific animals and plants. Around the volcano, due to the effect of volcanic gas, characteristic plants, such as Rhododendron kiusianum and Cowberry, grow in clusters, presenting unique scenery. The grassland area over the mountain base has been kept from becoming a forest through such activities as pasturing, controlled burning, and mowing for many years. 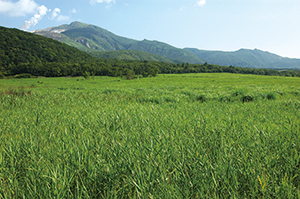 The dominant species is Japanese silver grass, but precisely because it is kept as grassland, many rare endangered species such as Echinops setifer, Viola orientails, and Ehimeayame (iris) are preserved. It is a very important habitat for such plants. 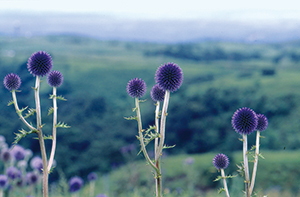 In the Tadewara Moor and other moors, you can see scholarly precious vegetation where Sawagikyo (balloonflower), Numagaya (grass), and other plants grow in clusters. 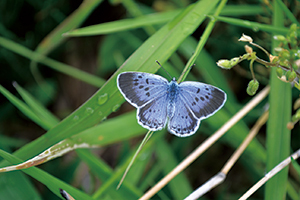 Some of the characteristic creatures here are butterflies, including rare species that eat grass, such as Shijimiaeoides divinus (that eats Shrubby sophora) and Scarce Large Blue (that eats Great Burnet). 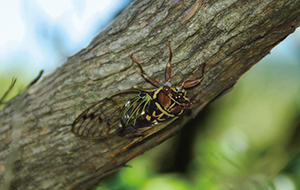 Additionally, there live such insects as Kyushu-ezozemi cicada in forests and Daikoku-kogane (scarab beetle) on the grasslands. Many birds are grassland species, such as Meadow Bunting, Chestnut-Eared Bunting, Zitting Cisticola, Japanese Reed Bunting, and Black-Browed Reed Warbler, and there also are raptor species such as Eastern Buzzard and Japanese Sparrowhawk. Other creatures include Japanese Odd-scaled Snake and Tiger Keelback and the Japanese Giant Salamander, Spotted Salamander, and Kajika frog for amphibians. 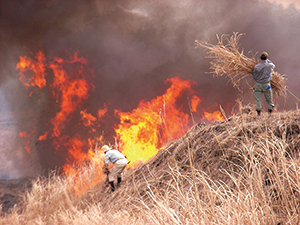 In spring, this park's grassland is entirely burned off. This has been continued from over a millenary ago so that grassland wouldn't change into forests and in order to use it as silver-grass field or rangeland. In this park there are many onsen areas that are the gift of volcanoes and have been loved by local people and tourists from ancient times.